Here's a bunch of x0xb0x mods you might want to put in. Just about any mod that works for the 303 can also be made to the x0xb0x. I found this mods on a schematic. Its not tested but should work: basically it just lowers the bass cutoff by one octave. 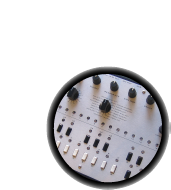 "the more pronounced resonance of the 303 is due to the high gains on the pnp transistors in the vcf. we couldnt get the exact 'binned' parts so the gains may not be as high as the original. the 2sa733p has a beta (gain) which ranges from 270 to 310 or so whereas the 2sa733ap has a beta from 300 to 350 or something of that nature. (the original used 2sa733ap's whereas we use 2sa733p's) ...so if they check the betas they can place them at the right place. id start with q10 then q9 and if there is one good one left the vco could use one at q8"
"the warble in the resonance is due to powerline fluctuations since the synth is run off of an op amp as a power supply. it has troubles at high current draw. also there are tons of low pass filters on the supply that cause droops when large power surges occur. r95 and c28 for example. at any rate, the power supply we built was a bit stiffer than the original. this stiffness can be taken away by increasing the resistance of 100ohm resistor that feeds the opamp. i havent verified this but im pretty sure it would give more warble as the op amp would saturate sooner at higher currents also the bypass cap at that point could be decreased"
So, if you want to get a better 'clone' of the original resonance, use the highest-beta (preferably 300 or higher) transistors in Q10, Q9 and Q8. Then replace R1 in the power supply, on the IO-board, with a larger value, perhaps as large as 200ohms. Note that there are a few different ways to measure 'beta' and your meter may not be the same as another. Therefore, just pick the highest beta (test all of them) and mark those with wite-out or similar. 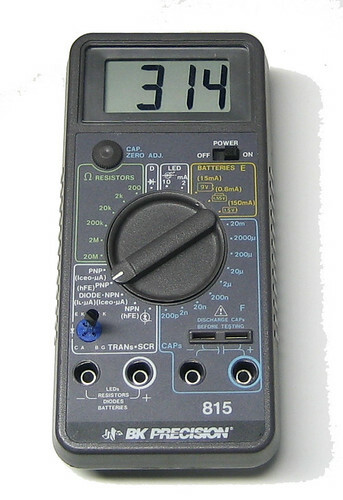 Be sure to read the manual for your multimeter to see if it has transistor beta/hFE/gain testing. The 733 is a PNP with ECB (emitter-collector-base) pinout so put it in the tester properly! If you dont have a multimeter with built-in beta testing, you can build this simple circuit using inexpensive components and use it to test the betas of your 2SA733Ps. Be sure to use a rail-to-rail op-amp such as the TLC2272, and 1% resistors if possible. (If you cant find 1% resistors, get a bunch of 5% ones and measure them to find the closest valued one in the bunch) Any 9V battery will do. What is beta? Beta is the ratio of 'base current' (current that flows from the base to the emitter) to 'collector current' (current that flows from the collector to the emitter). You could also call it the "gain" of the transistor. Beta varies with a lot of parameters, including temperature, the collector current you're using to measure with, the voltage between the collector and emitter, as well as inherent differences during manufacturing. This circuit keeps a constant 1mA current going thru the collector and measures the current going into the base, through the 1MEG resistor. Now, mark your 'high beta' transistors with whiteout or nailpolish to identify them. Use any panel mount jack, and connect the sleeve to ground. The tip should be connected to one side of a 100K resistor, the other side is connected to the negative side of a 1uF capacitor, and the positive side connects to the point where R70 and C17 touch. Remove R61 and replace it with a jumper wire. This will make it possible to turn the envelope modulation all the way down. The switch caps used are available in 4 colors: black, white, grey and red. You can buy them for cheap at Digikey and snap in whatever you want. They are part numbers 401-1152-ND, 401-1153-ND, 401-1154-ND, and 401-1155-ND.